Moving to Bogota (or any other place that’s far from home) is a big step for anybody. I first moved to Bogota in October 2013, and I’ve since discovered there are many different reasons why people choose to move here. Oftentimes, as in my case, it’s to join a Colombian boyfriend or girlfriend. Sometimes it’s a case of the ‘trailing spouse’; one person gets a job or gets transferred to the Bogota office and the spouse/partner follows. Others hope for adventure and new experiences; to live and work in another country, meet new people and broaden their perspective. Others want to retire to a country where their pension will go further. No matter how prepared you think you are, nothing quite prepares you for the noise and chaos of Bogota! It’s quite common for homesickness and culture shock to set in within the first month. Here I’m going to give you a list of things you can do which will help you to settle in quickly and hopefully lessen the effects of culture shock. If you’re not joining a partner who already lives in Bogota (or if you’re not ready to live together), you will need somewhere to stay. This isn’t the same as finding somewhere to live (see further down). When you first arrive in Bogota, it’s a good idea to rent somewhere on a short-term basis while you spend some time checking out the different neighbourhoods. This way you can work out where you feel comfortable and where you might like to live long-term. For the first month, you could find somewhere on Airbnb or check out GuesttoGuest and use their free points system to get cheap accommodation in Bogota. Alternatively, you could post in the Bogota Short Term Rentals Facebook group (or check out the ‘Items for sale’ on the left-hand side to see people’s adverts). You can also try posting in the Secret Bogota or Expats in Bogota groups. These groups are also a good way of keeping up with the conversation and finding tips on places to go or upcoming events in the city. Apartment International rents 1-bed apartments for $900-1,000/month which may also be an option. Have a walk around and check out your local eateries. A big part of settling in after moving to Bogota is getting used to the food. Do a Google search, look on Google maps around where you’re living, check out Trip Advisor, or check out my favourite places to eat in Bogota. Finding somewhere that does a nice breakfast or lunch means you’ll have somewhere to go where you can eat well when you’re hungry and don’t feel like cooking and eating alone. You’ll also get to know the people who work there and start establishing relationships with the locals – another big part of settling in! In the first two months after moving to Bogota, I barely ventured out alone. I found it difficult to fathom how the TransMilenio worked and I’d heard too many bad stories about taking taxis! I was lacking in confidence and this made me miss London, where I’d take the train and tube nearly every day without a problem. Nowadays I use the TransMilenio app to work out which bus I need to take when I’m not sure, and I usually take Uber instead of taxis (although the taxi apps are helpful, and you now have the option of requesting a driver with a high customer rating). Once you feel confident travelling through the city you’ll feel a lot more settled. It’s natural to feel lost and lonely when you move to a new place. This was one reason why I booked onto the 1-month CELTA (English teaching) course at the British Council in Bogota as soon as I arrived. This helped me get into a daily routine, and I met some great people on my course, a couple of whom I’m still friends with today. It also helped me get my first teaching job in Bogota. In your case, you might want to do an intensive Spanish course; do some volunteering (see below); go to one of the language exchanges so you can meet locals and other expats, join the American Women’s Club; do some of the tours on offer so you meet people and see a bit of the city. Here’s the post I wrote on how to meet people in Bogota. If you’re moving to Bogota to work and/or study, I strongly recommend looking for an apartment that is close to where you’ll be travelling to each day, or that is an easy TransMilenio ride away. This is another reason why I suggest finding a place to stay just for your first month in the city before committing to anything long-term. The last thing you want (trust me on this one!) is a long commute through Bogota’s rush-hour traffic twice a day. I’ve done it and it made me miserable for the first few months in my job. My quality of life changed completely when we moved across the city in 2014 and I only had a 20-minute walk to work. My post on finding accommodation in Bogota might be a good place to start and I also talk a bit about some of Bogotá’s neighbourhoods in my post on Where to live in Bogota. A common way to find places for rent is to walk around the neighbourhoods you’re interested in and looking for ‘Se arrienda‘ (For rent) signs in the windows of apartment buildings. If you speak Spanish, you can also buzz at a building you like the look of and ask the doorman if there are any apartments for rent in the building. You then call the given number to arrange a viewing (or they may have left the keys with the doorman if you’re lucky). Or you might prefer to share with others, in which case check out Bogota Short Term Rentals Facebook group or the other Bogota expat Facebook groups. If you’re looking to buy a property in Bogota, contact me and I can refer you to some English-speaking agents (expats) with loads of experience in Colombian real estate! They’ll be able to answer your questions and set up some viewings once you’re in Bogota. A common question people ask in the online forums before moving to Bogota is whether it’s advisable to try to get a job before arriving in Colombia or whether to start searching once you’re here. The answer is, it depends on what type of job you’re looking for, but essentially you could do either. If you’re a university-qualified teacher, the best bet is to apply to international schools and try to get onto one of their lucrative international contracts if possible. If you are TEFL/CELTA/TESOL qualified and have some teaching experience, you could try applying to the British Council for a full-time or hourly-paid teaching job either before you arrive or after you get here. They usually prefer full-time teachers to have a DELTA or Master’s degree in ELT. For any other English teaching job, you’d be better off applying once you’re here. Here’s my post on finding a job in Bogota. If you’re moving to Bogota or anywhere else in Colombia and plan to stay for longer than six months, you may want to open a bank account. I recommend going to a bank in an area where there are lots of foreigners, such as the Zona T or Chicó. The bank staff in these areas will have dealt with foreigners before, which should make the process a bit smoother. Some banks will tell you that you need a cédula de extranjería (Colombian ID card for foreigners) to open an account, which you only get once you have a Colombian visa. I know people who have opened accounts at Bancolombia with just their passport, so it can be done without the ID card. It’s worth remembering that when people don’t know how to do something over here, they’ll often just tell you it’s not possible rather than admit they don’t know. I’ve also heard that international bank transfers are easy to arrange if you have an account with Bancolombia. Most bank staff won’t speak English, so if necessary, bring a Colombian or Spanish-speaking friend with you when you go to open the account. I’ve lived in Argentina and Mexico. When I moved to Argentina, I only knew a few words in Spanish, but I found that many people spoke at least basic English, so I was able to get by. In Colombia, most people speak very little to no English, so it will be essential for you to learn how to have at least a basic conversation in Spanish. 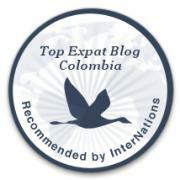 This will also help you to get to know the locals and adapt to Colombian culture. Here’s my post on learning Spanish in Bogota, with some suggestions on where to study. I think people often feel better when they feel like they’re making a difference by helping others in the community. There are a number of volunteering opportunities in and around Bogota, but many of them will require basic communication skills in Spanish. One option where I know some volunteers speak English is the soup kitchen, run by Fundación 3DC, under the bridge at Calle 127 and 134 on Friday evenings – contact Adriana at adrianagarciaortega@wiselearningsystem.com (she speaks English) for more information. There are also volunteer opportunities at the Casa Kilele-Casa Cultural in Teusaquillo, a cultural centre offering art, dance, yoga and music classes, workshops and performances. Hands On Bogota, Fundación Hogar Nueva Granada, the Rise and Walk Foundation and Fundación Catalina Munoz have all been recommended on the Bogota Facebook groups to people wanting to volunteer. If you need some free accommodation, the CX Hostel offers a free bed and breakfast to volunteers who can commit to at least a month of volunteering (working at the hostel). Get in touch with them to check their vacancies. 10. Focus on the positives! When I was in the throes of culture shock during my first few months in Bogota, I think it’d be accurate to say I pretty much hated everything about Bogota(!). The traffic, the pollution, the packed TransMilenio, the crevices in the roads that would have me holding on for dear life on the bus, the food which would upset my stomach… well, you get the picture! But everything seems worse when you’re missing home and suffering from culture shock. How did I get out of the rut? I came to the realization that I owed it to myself and my boyfriend to focus on the positives. It was the only way to adapt and start to feel more comfortable. So, I regularly visited my favourite places – the Botanical Garden, the Gabriel García Márquez Cultural Centre (they have great art exhibitions on the basement level), and my favourite restaurants. These places made me feel good and I enjoyed spending time there. I’d also search for new places to visit and explore new parts of the city. Bogota is a tough nut to crack, but once you get beneath the surface, there really is something for everyone to love. I actually started this blog to feel like I had some sort of purpose at a time when I was feeling lost shortly after moving to Bogota. I thought that if I could help others who were feeling the same as I was, maybe I could do some good. In doing this, I also felt better about being in Bogota! So those are my top 10 tips for adapting to life over here. I’m always happy to answer questions when I can, so get in touch if you want to ask me anything or if you’re finding it hard to adapt. Do you have any tips for people moving to Bogota, or who are finding it hard to adapt to life here? Are you suffering from culture shock or homesickness after recently moving here? Leave your comments below and let’s help each other through this! Going out and exposing yourself to the culture is key. Great post! Thanks for sharing this. I am planning to visit Bogota and stay a few months. Just found your blog after staying in Bogotá for a couple of weeks. I wish I would have found it during my early planning stages. This information is excellent! It is I nformative and (now) relatable. Thank you for sharing!! You’ve made me feel loads better about my current adjustment period. Thanks Jen, I find Bogota is an acquired taste! You’ll get used to it and realise there are things you love and hate about it, but it’s all part of the adventure 😉 all the best and enjoy yourself!